Reuters has run photo of a bloodied Honduran protester (below) dramatizing the bloodshed at protests for Manuel Zelaya. (h/t) Problem is, this photo appears to be staged. He did see an older man in a white shirt reach down into the blood pool and cover his hands. He then wiped them on his shirt to make it look like his blood or that he had been involved. Hunter saw what he thought was an AP photographer take the man's picture. Hunter said if you see it on the web, don't believe it. It was faked. If you look at the man in the photo, it is clear that the blood was not the result of a wound, but was wiped on his shirt, just like Hunter said. This photo was staged, although the Reuters photographer did not necessarily know it. 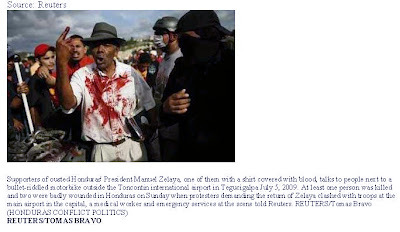 The caption on the photo says: "Supporters of ousted Honduras' President Manuel Zelaya, one of them with a shirt covered with blood, talks to people next to a bullet-riddled motorbike outside the Toncontin international airport in Tegucigalpa July 5, 2009." Reminds me of Paliwood fauxtography. Sometimes you cannot believe your eyes. UPDATE: Gateway Pundit found other photos of this same faux-victim, and Hunter has a new post on it. A pleasure to have been of service, sir. Thank you for the h/t. what's the story here? The Reuters caption is exactly what apears on the photo. Your headline is more misleading. Great post! Keep us in the loop please!! Caged, Reuters does not deal in truth but in innuendo and slant. The slant here is that someone was injured while protesting the ousting of Zelaya. That slant is false and Reuters deserves to be called out. Try Google sometime. Many compilations available of established Reuters fauxtography. What kind of Useless Idiot defends Reuters or any MSM entity, anyway? The Astroturf kind? Um, there is no claim that the protester with the blood was the one injured. He was there and blood was spilled b/c the army KILLED at least 2 people. Funny how you fail to mention this. You are the one trying to manipulate the media from your blog, and keep the wingnuts rabidly for a coup in a country they know nothing about. All you know is Zelaya=Chavez=Bad=Let's tie ourselves in intellectual knots trying to justify this thing b/c we hear he's lefty. Since you supposedly are a law professor, why don't you explain to me why the coup was legal? If Zelaya violated the law, then why didn't they try him? Why force him out of the country under the barrels of machine guns? Why present a fake resignation letter? Why suspend the individual liberties guaranteed by the constitution you profess to hold so dear to your heart? Tell me what article of the Honduran constitution Zelaya violated, and don't say 239, as he was calling for a ballot question to convene a constitutional assembly on the same day they were to choose a new government. If Hondurans had voted for it, the assembly would have convened way past when Zelaya would have left office. Please just keep on talking about Obama's mustard or whatever other drivel, because it is obvious that the only thing you know about Latin America is what your right-wing ideology and pundits allow you to believe, not facts and history. Reuters doesn't necessarily come out of this looking bad, but clearly this was staged--the viewer is meant to believe the violence was serious enough to get this man's shirt bloody. That is something quite different from this man's actively putting the blood on his own shirt. The effect of the picture is to exaggerate the violence. revolter1932, I have always assumed Prof. Jacobson is a U.S. lawyer, whereas the "coup" took place in Honduras, which has its own constitution, probably somewhat different from ours. Is one of those facts wrong? hat and put on his left arm carries a book. Were he the victim of a beating not only would he be visibly wounded; his clothes would be missing or in disarray and he wouldn't have a hat or a book anymore. Furthermore, it is clear that the blood on his shirt did not come from a wound as the spot defies the law of gravity: it is obvious that man has stained himself with his right hand. A photographer with an eye should have noticed this, but he did not. Why? reporters." This kind of ambiguity is not permissible in the news. accurate confuses any reader without a trained eye. Thank you for making this statement and clarifying the truth about this photo. In the midst of what is happening in Honduras, we are also battling a huge media war. The people of Honduras want the international community to know the TRUTH and not judge simply by what they read in one news outlet. We ask that you look for and hear the voice of Hondurans as they fight for democracy which was going to be robbed by Manuel Zelaya. The slant here is that someone was injured while protesting the ousting of Zelaya. I may regret asking this, but where do you think the blood came from? The blood bank? The effect of the picture is to exaggerate the violence. No, it doesn't. Since we're not seeing the actual victim, the picture actually understates the violence. Yes, please concentrate on the bloody shirt, not the right wing military coup against a democratically elected government, the shirt is what is important and those liberal media jerks who keep exaggerating the violence, even though people have already died, just worry about the bloody shirt. This blog article was written by an associate law professor at Cornell? Wow, I had no idea that the Ivy League had dropped their standards to wingnut levels.